Pursuing M.B.B.S first Year from Gandhi Medical College, Hyderabad. He works on Character sketching, lights, stage setting and voice over. 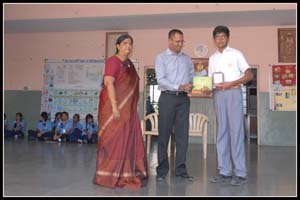 Presently pursuing Bachelors degree in Library Science and Preparing for Competitive exams. Successfully completed Sphoorthi Internship Training Programme-2012-2014. Specialization in Puppet designing and Puppet building. Successfully completed Sphoorthi Internship Training Programme-2012-2014. Specialization in Lightings and Sound effects. Working for Intergraph, Hyderabad. Successfully completed Sphoorthi Internship Training Programme-2013-2014. Specialization in drawing, painting and puppet making. P.G.Diploma in Tribal Development Management from National Institute of Rural Development, Hyderabad. He is awarded Tetra Pak Ambassador for the year 2013-2014 by TERI-New Delhi. Soyam Bheem Rao, M.B.A from Keslaguda Village, Indervelly Adilabad District, Andhra Pradesh. Associated with Sphoorthi Theatre from January 2012. His interests are participating in Elucution, Extempore, Tribal music and Singing. Highly creative and a good leader. HK Punesh,, M.A, B.Ed from Indervelly, Adilabad District, Andhra Pradesh. Associated with Sphoorthi Theatre fromJanuary 2012. Good tribal dancers, participated in National tribal dance festivals in India. Creative and good leader.